I am just curious, does anyone here from his area know what religion Mr.Litton practices? Like Does he go to church on Sundays in clarkson/davison? Yes, he's a Seventh-Day Inventist. He got kicked out because he would always line up last for communion but still beat everyone back to the pews. I was looking at the Naples Half marathon results in 2008 and saw Kip's result (1:23) did we cover that one? I can't find it on the blog. I thought we did. Help please. Does anyone have any addtl info about this one this past November? for one he registered as David Kipling, no Litton in the name. SOKLR - see my reply to this question on the previous page. Nobody is going to run w/Kip carrying a camera. Not needed. Just eyewitnesses is enough - that and splits that are even and make sense. Just wear these Fred, you will be disguised as his brother. The Ocean Drive Marathon in New Jersey would be a prime race for the ole Kipster to crash. The race is point to point and does not have chip timing. Essentially, someone could plant themselves 1/2 mile from the finish line, jump in when nobody is around, and run across to a great time. 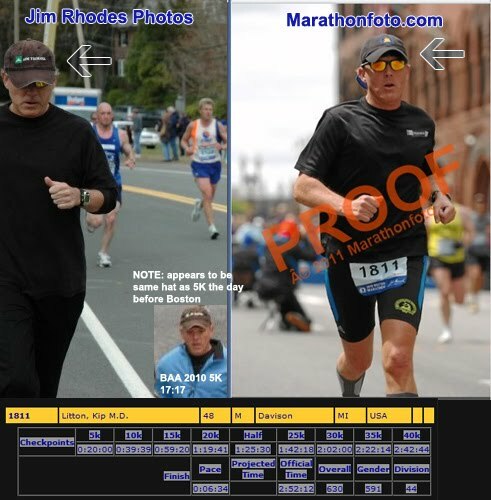 If a person were to do this, thy would not be in any of the race photos, however, as we have learned from a few other races, that does not always constitute a DQ. Is the Kip Litton industry dead these days? Did he stop running, or just stop running up the Kip Litton name? This has been discussed repeatedly, but when I was in Boston this past weekend, my fiance and I did the 5K. We started way in the back as it was simply a fun run for the both of us. Our first mile was 9:20, and there was simply no way we could have gone any faster unless we ran on the side of the road that was opened to traffic, or just shoved people out of the way. It got a little better, but we were only able to run slightly faster for the remaining of the race without weaving or cutting someone off. 4 minutes 4 seconds difference between net and chip times. In the ODM, a photographer sets up along the beach front in Sea Isle City about a half mile from the finish. So 'ole Kipster could end up with 3 or 4 shots from this section. He'd be missing from the other photo areas (intentionally leaving the locations out), though. The problem I have with all of this is the excessive heel striking. That is horrible news. Can we send him a card? What's the article going to say? Can we read what you've written so far?